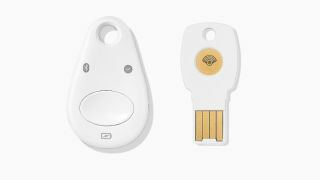 After internal success at preventing phishing attempts, Google makes its in-house Security Keys available to everyone. Google recently made headlines when the company revealed that it had prevented its own employees from falling victim to phishing attacks by switching from two-factor authentication (2FA) to physical USB-based Security Keys. Now the company has made its Titan Security Key available to all in the Google Store with a full kit available for $50. The kit itself includes a USB key, a Bluetooth key, a USB-C to USB-A adaptor and a USB-C to USB-A cable. The key was only previously available to Google Cloud customers but now anyone looking to better safeguard their accounts and devices can purchase one directly from the company. The Titan Security Key is built to the FIDO standard and works as a second factor for services such as Facebook, Dropbox and Github. However, the keys were designed to work seamlessly with Google account logins as part of the company's Advanced Protection Program. There is currently a waitlist for Titan Security Keys on Google's site but users can enable security keys for their Google account on the two-step verification page or by signing up for the Advanced Protection Program.